Somnolent villages on one side and the fierce Arabian Sea on the other, 320 km long coastline of Karnataka beaches stretching across the state of Karnataka is prestine and beautiful. Boasting of around 87 beaches in its vicinity, beach tourism in Karnataka is still its infancy. On the beaches of Karnataka, one can hear the chirping of birds and eye the pleasant view of turquoise water. 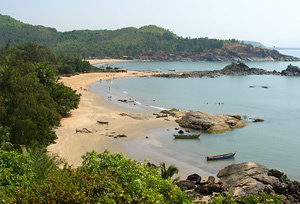 Even some of the prominent beaches like Om, Gokarna and Kundle are far beyond beautiful than the neighboring states. Whether one wants to swim, socialize, sunbathe or just want to soak up the local vibe, there's something for everyone. Karnataka is a beautiful beach destination focused on adventure, ethnic culture, serenity, and exclusivity. If tourists are looking for some action-packed adventure activities, there are beaches in Karnataka to satisfy their thrill thirst. Relatively unexplored by wayfarers, western coastal beaches in Karnataka are slowly gaining water sports destination in India. 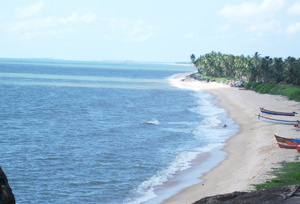 Marvanthe Beach in Karnataka is known hub for water sports activities. Jet skiing, kayaking, water skiing, swimming and also offer paddle boats, row boats, and shikhara rides are some of the prominent outdoor activities that are offered in Marvanthe Beach. A wide and handsome sandy strip is perfect for joggers and cyclists as well. Malpe coast in Udupi is the perfect place for adventurers to master the art of water sports activities like scuba, snorkeling, and surfing. Besides the serenity and adventure, coastal plains of Karnataka are also famous for its inviting temples. Murudeshwara Temple, Mahabaleshwara Temple, Gokarna, and Udupi are some of the prominent temples that can be spotted on coastal plains of Karnataka. The ancient temples in Gokarna spring to life during the festivals such as Shivaratri and Ganesh Chaturthi. Karnataka's sun-kissed beaches and azure water welcome every tourist with open arms. So, go ahead and catch up on life's little pleasures in this wonderland of beaches, history and culture. Devbagh Island, Kurumgad Island, Gokarna beach, Murudreshwar Beach & Kapu Beach are some of the renowned beaches in Karnataka where one can spot Dolphins. As per the survey of CNN, Om Beach in Gokarnais counted amongst Asia's top 20 beach gateways. Om Beach, one of the Gokarna's five acclaimed beaches, is outlined in a shape of 'Om', which is aspiritual Hindu symbol.